Oil extraction isn’t a flawless technology, and there continue to be too many reminders of this fact. Not always as dramatic as the loss of the Transocean Horizon Oil Platform and subsequent major oil spill in the Gulf of Mexico which BP continues to pay billions to clean up, there are other engineering systems which fail and cause a release of petroleum into the ocean. 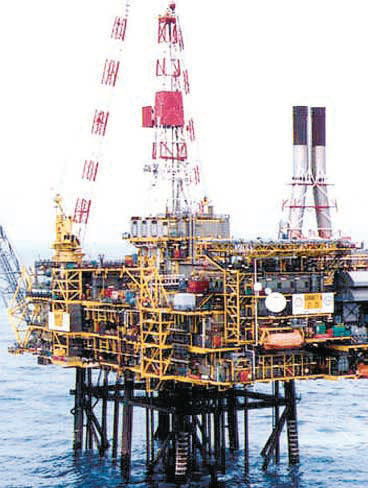 Shell Oil's Gannet Platform in the North Sea, co-owned by Exxon, has been leaking oil for days. The solution proposed by Shell to mitigate the spill is to sit back and let "wave action" do the cleanup for them. The leading-edge cleanup technique of letting nature fix it for Shell comes at the same time Shell presses forward to drill in the Beaufort Sea in the Arctic - an area that the U.S. Coast Guard believes would be extremely difficult to access much less clean up in the case of a spill. On Friday 8/12/2011 Royal Dutch Shell PLC announced that an oil spill has occurred at its Gannet Alpha platform in the North Sea. Shell’s Gannet Alpha platform is about 112 miles east of Aberdeen, Scotland, and has resulted in a sheen of oil on the water’s surface about 20 miles long and 2.5 miles wide. While the volume of the release wasn’t immediately available, Shell now, based on the size of the sheen seen on the surface, that the spill is around 120 barrels of oil. This is yet another incident in a series of problems with Shell’s offshore facilities in the U.K. The Daily Telegraph Newspaper reported that the leak at the Gannet Alpha platform is but one in a series of spills: “All four platforms serving Shell’s Brent field have been shut for maintenance after a piece of the Bravo platform fell into the sea in January. Shell said yesterday it had re-opened its Brent Alpha and Bravo platforms after a seven-month closure. It is expected Brent Delta will resume in the near future and Brent Charlie, which has experienced gas leaks, to restart next year.” Gannet field is co-owned by Exxon and Shell, with Shell serving as the platform operator. While we do have examples where just leaving the oil alone is the best solution available (think of the harm caused by well meaning cleanup crews to steam-cleaned the shoreline in Alaska following the Exxon Valdez oil spill, which effectively sterilized the shoreline killing everything, not just the organisms fated to die from the oil alone) it is still disturbing to think that “wave action” is a preferred cleanup technology given that Shell, which often touts a stellar environmental record and superior engineering capabilities, is in the process of securing permits to drill in the icy waters of Alaska – an area where there is considerable consensus by experts that there is no reliable technology that will allow cleanups in the icy conditions that comprise a large amount of the year. Since no engineering solution for exploring and producing oil and gas at sea is foolproof, with an ongoing series of leaks from platforms, pipelines and other components of the oil and gas exploration, production and transportation system, one wonders why we allow any company, including Shell which touts its engineering expertise and conservative engineering practices but who still experiences oil spills at sea, to drill in the Arctic. Are we are simply accepting that we are likely writing off the biology of that area at some point down the road when the prevention measures fail and the cleanup technology fails as well? When oil spill mitigation still includes “the secret to pollution is dilution” one must wonder what the Obama Administration is thinking as it gets incrementally closer to granting Shell the permits it needs to drill in the Arctic when drilling in non-icy waters already has proven to be difficult and fraught with complications.